Google's new Latitude Web app for iPhone is so hamstrung that Apple customers may be wishing they had a BlackBerry or Android handset instead. Why? Because lacking multitasking, Latitude really isn't Latitude. 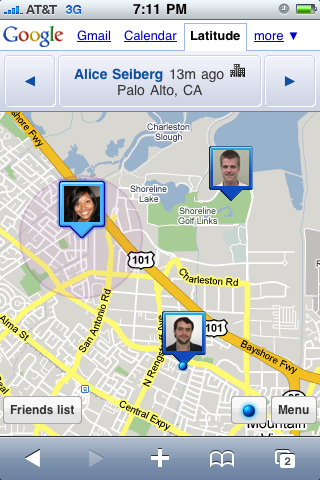 Google Latitude isn't a standard iPhone app. It's a Web app with limited functionality. Here's what the free Google Latitude service does: It allows you to make your location available to other users in near real-time. On the color BlackBerry models, Android, Symbian/Nokia, and Windows Mobile--lets call these "real" mobile platforms--this is done constantly and in the background. This is how God--and Google--intended Latitude to work: Without user attention or intervention. And this is the functionality that iPhone users have been waiting on for months, only to receive a third-rate version of a first-rate application. But, there's more: On the iPhone and iPod touch, Latitude isn't even given application status, but is delivered as a Web application in the Safari browser. I have a number of potential uses for Latitude in my business and volunteer lives. This is an app I'd been anxiously waiting for, smug in my knowledge that my iPhone was always the better platform. I'd even imagined that Apple would open up multitasking on the iPhone, just for their Google buddies, if no one else. Obviously, I was wrong--and I'm also disappointed. Which is bad news if other platforms that turn multitasking into a key feature they have (and iPhone lacks). "Unfortunately, since there is no mechanism for applications to run in the background on iPhone (which applies to browser-based web apps as well), we're not able to provide continuous background location updates in the same way that we can for Latitude users on Android, Blackberry, Symbian and Window Mobile." "Nevertheless, your location is updated every time you fire up the app and then continuously updated while the app is running in the foreground. And, of course, you can check in on where your friends are, so we think there's plenty of fun to be had with Latitude." In other words, Google expects the iPhone to be a mostly one-way Latitude device, used to find your friends all the time, but able to send your location only when Safari is the foreground application. That's not plenty enough fun for me. I want a tool, not a toy. OK, I won't junk my iPhone over this, but my love is diminished. And maybe my anger shouldn't be directed at Apple. Perhaps, Latitude generates enough network traffic that AT&T put the kibosh on it. Either way, my smug iPhone superiority has been pierced and now I have to make excuses to my friends who use Latitude on platforms that support it properly. This seems like a small thing, but it has me thinking that someday my next device won't be an iPhone. Good work, AT&T and Apple!